Estimate How Much Neanderthal Is In Your Ancestry! An update for customers who have tested with the DNA Fingerprint Test. Created in response to the phenomenal interest generated by the revelation in scientific journals on May 8, 2010 that most humans are part Neanderthal (Green et al), our autosomal DNA Neanderthal Index reports any strong matches you have with populations identified as Archaic, those preserving the earliest earmarks of interbreeding between Neanderthals and humans (Homo sapiens sapiens). The stronger the match the higher the likelihood that your ancestors gave you Neanderthal genes. You receive a detailed list of population matches with Berber, Finnish, Indian, Turkish, Syrian, Iraqi, Egyptian and other Archaic Populations; an interpretive analysis highlighting your Neanderthal affinities; map of Neanderthal homelands; references and suggestions for further reading; and a certificate displaying your result. We use your existing profile. There is no need to be resampled or retested. If you have not taken a DNA Fingerprint test, you will need to order the Neanderthal Index with DNA test included and start from the beginning. Note that this test does not directly examine your genetic material. Only a large-scale genomic sequencing procedure like the Human Genome Project or Draft Neanderthal Genome can do that. The Neanderthal Index is based on probabilistic predictions of the occurrence of your unique DNA Fingerprint in Archaic Populations retaining Neanderthal genomics and traits. Autosomal predictor of Neanderthal DNA in your genome. Read the original press release from the Max Planck Institute for Evolutionary Anthropology in Leipzig. 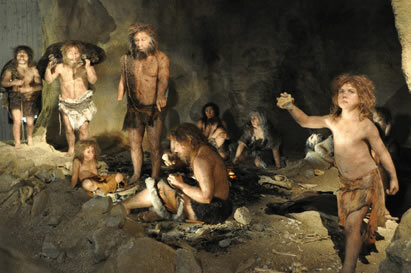 It was embargoed for May 6, 2010, 8 p.m.
Photo: Reconstruction of a Neanderthal group. (Copyright: Johannes Krause). Neandertal group by Atelier Daynes, Paris, France. In: Museum of the Krapina Neanderthals, Krapina, Croatia. Project and realization of the Museum: Zeljko Kovacic and Jakov Radovcic.